Posted on February 20, 2018 . 15 Comments. First thing’s first: You can’t let your ego keep you from reaching your true potential. When trying to improve your pull-up, it is often the case that you will have to take 10 steps back to move 20 steps forward. I remember a few years back when I first heard about the Beast Tamer Challenge. I was so fascinated by the idea of it. I have trained weighted pull-ups since I started training, so I saw it as one of my strong suits. So I started to train for the Challenge, but with no real attention to detail. I didn’t have access to a beast (48kg) at the time, but I managed to work my way up to a double 24kg pull-up. The only problem was, I did not touch the bar. I thought this would be an easy fix: I just have to touch next time. I’ll tell you what, 2 inches never seemed so big. In order to rebuild strength in the new pathway, I had to drop down to just bodyweight for a while until the new pathway felt normal. I even had to cut back on my reps. Where I could do repeat sets of 12 the old way, I had to drop down to sets of 6-8, which was very humbling. Then, slowly, build back up. During my journey back to a beast pull-up, I scoured just about every StrongFirst article and earned my SFL and SFB Instructor credentials-all of which were pivotal in helping me find a route that helped improve my pull-ups. I have since applied these methods for many others, and it has worked for them as well. First you have to start by restructuring your pull-up so that you make contact. Once you have created this new movement pathway, never ever do another pull-up that is not done to this new standard. So for a while, err on the side of caution. You want to make sure you hit and make contact every time. The idea of tactile feedback/proprioception is huge. I read an article a few years back, when I was restructuring my pull-up, that emphasized the importance of hitting this spot, basically making a mark wherever that spot may be on you. Whether it’s the top of your chest or your neck, you want to smash that spot often. I love grease the groove for this purpose. One perfect pull-up done multiple times with ease throughout the day. This “easy” manner will help your body remember success and will allow for strength to be built on top of a good foundation. If you work to failure, your body will remember failure. You want your body to remember success only. For this reason, I have people stop two pull-ups less than failure on any given set of bodyweight pull-ups. The second method that drastically helps to improve your pull-up is “intending to explode”. I read the idea of neural drive in Stu McGill’s book The Gift of Injury. In it he mentions how you want to have as much neural drive when you are deadlifting, and in order to do so, you need to think about exploding. Did somebody cue kettlebell swings? Talk about a great warmup for deadlifts (thanks Oliver Mosley) but that is for a different time. Neural drive is making the nervous system more efficient with its communication with muscles. Essentially being able to get the muscles to produce “more” force. You want this to be all the way turned up when you train. This really helps to prime the system. I like to apply this to the pull-up. In order to achieve this for the pull-up, I say always fast, always successful. If you have not gone to a StrongFirst Bodyweight Course or Certification, I highly recommend the two. During both you will learn many drills and cues for creating as much tension as you can and applying that to the pull-up. This will help with neural drive. Being able to get your muscles to contract “harder” is exactly what you want. The ability to get the most out of what you have. Therefore, during reps that are light you should move the weight as if it is max effort. Every time you do a pull-up, act as if you are trying to fling yourself and the kettlebell through the bar, and through the ceiling. When you feel your speed drop off, go down a bell size for your remaining sets. Like (Master SFG and StrongFirst CEO) Fabio Zonin says, “the set-up is the first rep,” and part of that set-up is having intent. You have to be thinking about success and you have to think “explosive”! 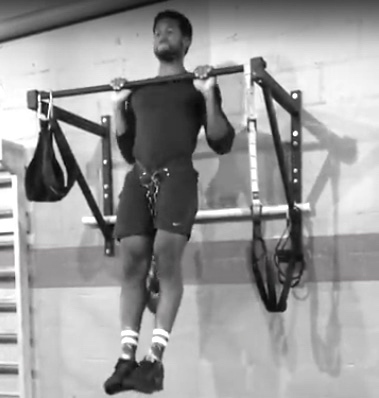 Combining these two skills together make for a powerful and explosive pull-up. Make sure to have the bar strike the same spot over and over again and make sure to keep your intent explosive. Both of these strategies take time and patience to develop. You will also need to put your ego in check, as it will want you to speed ahead and try to progress faster than you should. Denzel is a StrongFirst Team Leader and Beast Tamer. He owns Strength Den, a personal training facility in Mill Valley, CA, focused on building good movement and strong students. He coaches semi-private sessions and group training in which he incorporates all the knowledge he has learned over the years through StrongFirst. Denzel loves seeing people's progression from the first day they come in, to building a solid foundation, and then getting strong as heck! I would like to know what programming you used to prepare for the Beast Tamer challenge. I have done an exhaustive search but am unable to find a comprehensive program. Would love if you would share what you used to prepare for BT. I had an article written outlining what I had done as well as my training log. Unfortunately both are lost with an old computer. I have since started using google docs to avoid that issue in the future. As far as the programming I used to train for Beast Tamer, it was a mix. I used a peaking cycle for my barbell front squat and deadlift to help with the pistol and pull-up and figured there would be carryover to the SA overhead press since it is really a full body movement. For pistol, press, and pull-up I adhered to the Easy Strength model of 10 reps max and undulated the load and rep scheme. Pistols I only worked singles. Whether it was 5 singles, 3 or 1. Depending on how many sets I was to do I would choose a load. Wish I could be more detailed with this answer. 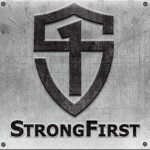 What I can say is that I spoke with around 10 people in the StrongFirst community who all had similar but different advice. The bottom line was to focus on your weaknesses and address them in the manner you think is best. Over the years i have read and bought so much of Strongfirst/Pavel material and i have come back to it again and again after experimenting with other things that go in the opposite direction. But the one thing missing from the body of work Pavel has offered, is to do with pull-ups. Considering how integral the pullup is, i have yet to see one true progression that works for those that are heavier. Most pullup articles seem to be directes towards those who already can do them! I have done grease the groove meticulously for both myself and others who struggle with pullups, and on test day we were all disappointed. I would love to see something from Pavel in the spirit of the Naked Warrior that becomes a classic on this essential movement! And yes, we have worked hard on the other progressions offered on the website by other excellent authors, i assure you. This link was disabled. Can you point to the full link? You made it look so easy, I tried with light but I will use you advice to lift more weights . I’m 75 years old and could do about 35 pullups a long time ago. In recent years after surgery for an incarcerated hernia, a hip replacement and glaucoma surgery my down time caused a great decrease in strength. I’m going to use this to try to get past 2 pullups as I’m not ready to give up yet. Richard, 35 pull-ups is awesome . Let me know how your journey goes. Thank you. I’m glad you found this helpful. I’m sure you too will tame the beast. Feel free to ask for help if you find yourself in need of some. Impressive–you made the 48kg look like bodyweight. How much tension do you use when you are moving fast? I thought the higher tension was for grinding out tough one arm pushup work and heavy weighted work. The tension is still fairly high. I like to think of it like a Kettlebell swing or the single arm military press. You are not tense the entire time, there is a moment of tension and relaxation. I’m training for the Iron Maiden and this is superb advice. Thank you!! No problem! I’m sure you will crush it. Let me know if you want any help.